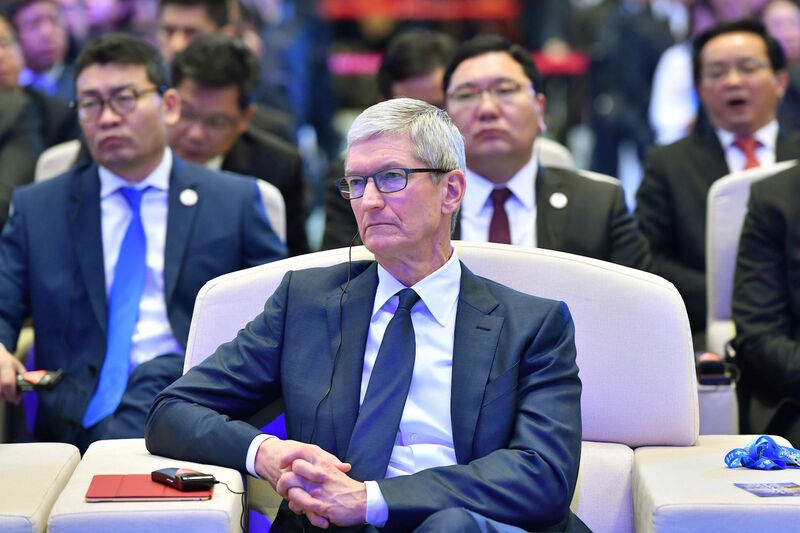 Apple CEO Tim Cook at the opening ceremony of the 4th World Internet Conference in Wuzhen, Zhejiang province, December 3, 2017. Samuel Wade is Deputy Editor of China Digital Times, and holds an M.A. in Sinology from the School of Oriental and African Studies in London. In July, following news that Apple had complied with Chinese demands to remove dozens of VPN apps from its local App Store, I argued that the company had little choice. Aside from holding the keys to market access, Chinese authorities have a potential chokehold on almost the company’s entire supply chain, granting them an extremely high degree of leverage. Unconstrained by any legal recourse, Beijing could wreak as much overt or covert havoc on Apple’s global operations as it wished. This is a situation of Apple’s and especially Cook’s own making, but the choices that led it there are perhaps understandable, taken years before the company became a major content gatekeeper, amid a pervasive belief that China was bound to liberalize. Apple might now carve out some more room to maneuver by diversifying its supply chain, but for now, it has little. Even if it did have a choice, this seems like a particularly bad point in history to encourage tech companies to hold themselves above national laws, however much we dislike them. These arguments might acquit Apple in the case of legally mandated complicity in China’s censorship regime. But by dancing onstage at the World Internet Conference, furnishing his hosts with golden soundbites about shared visions and common futures, and by endorsing hollow official rhetoric about “openness,” Cook has crossed a line. His appearance legitimizes the system of censorship and control in which he’s previously claimed to be an unwilling conscript—the same one that ordered the deletion of content describing the conference as a sham and Cook and other visitors as “beggars.” Gentle qualifications about technology “infused with humanity” don’t soften his misstep. Neither does the fact that Cook’s peer Mark Zuckerberg and his president Donald Trump have crossed the line ahead of him. China employs the power of its wallet—both the State’s and the consumer’s wallet combined together—to reward brands that heed the wants of China politically, while using this same power to punish countries and, increasingly, companies that go against China’s wants politically. South Korea and the conglomerate Lotte are a prime example that felt China’s wrath after the deployment of the U.S.-supplied THAAD missile defense system. China blocked tour groups from visiting South Korea. The total number of Chinese tourists to South Korea dropped 40 percent in April 2017 year-on-year. But China went farther and punished Lotte, the Korean conglomerate that ceded the land for the THAAD deployment. Lotte had dozens of its retail outlets shuttered in China by authorities, ostensibly for violation of the tax code and numerous other minor violations. Chinese consumers protested against Lotte. Beijing shut a Lotte joint venture with the American candy-maker Hershey, and local governments stalled plans for opening up Lotte theme parks in China. The rewards China bestows on the these foreign Internet companies can be huge—China is Apple’s largest market outside of the United States. It generated 18 percent of Apple’s global revenue in the third quarter of 2017. Most of its products are assembled in China. Executives salivate at the size of the Chinese consumer market. It has become the largest market outside of the U.S. for companies ranging from Starbucks to Nike. China has smartly used it wallet to get what it wants politically beyond its own borders. See how publisher Springer censored its own book catalog. China’s wallet is a power so large and lucrative that no single Internet company can withstand it. Going forward, it is only at the government-to-government level that these issues can be worked out. It is surprising that neither the Obama nor Trump administrations made a bigger push for greater access for Western technology firms in China—such a push should be couched not as a human rights issue but one based on money. America’s Internet companies are losing out on billions of dollars of profit under the current policies. I understand Internet companies are transforming themselves into nationless global companies. This trend will require more cooperation between countries and their governments. Individual companies are not able to confront overseas governments effectively. Governments, however, can agree to speak with other governments to define and defend basic principals and public interests. The Chinese government has become much more confident in recent years and now imagines itself at the center of the world. Understanding China’s complexity and vulnerability and the nature of Chinese propaganda in communicating with both outsiders and insiders, is more important than ever. Western countries should not encourage the Chinese government’s over-stated ego, nor give it recognition as the leader of a strong and civilized country, especially considering that human dignity and the public interest are not priorities among Beijing policymakers. If we recall the early 1980s, there were many more challenges and frustrations with doing business in China then than today, from government red tape, to a lack of skilled workers, to poor infrastructure, and even power outages. There weren't many restaurants and bars to hang out in. If they wanted to exit China simply due to some of the frustration of operating there, I think a lot of these companies would have left long time ago. I want to repeat my argument in the Google case in 2010: if you want to help change China for the better, you should involve China in your work and be there on the ground. Otherwise you won't have an impact on the country simply by claiming a high moral ground and distancing yourself from the place. Leaving China is an easy decision for Google to make. Staying on is a much tougher one.